Enough About Hooked… How are YOU? That’s how many hours Cap’n J and I spent at the dock over the last 47 days of our season. As if finally grasping the fundamental trick to making a living fishing – keeping your hooks in the water – we pushed ourselves to make the quickest of turnarounds this year. As fishermen, this hard-charging approach served us well. As a writer, it wasn’t so good for me. Midway through one of our last trips, I stood in the cockpit wiping sea lice from a coho’s supple body, my thoughts drifting like kelp torn free of the sea floor. I wondered how Jen Pickett’s gillnet season had gone, and if fall storms would trap her in Cordova. What was going on for all of the Red Wheelbarrow Writers? How was Emily holding up, dealing with her mom’s Alzheimer’s? What beautiful bit of writing was I missing from Sifting the Grain, and what were Lisa W. Rosenberg’s latest observations on body image and identity? Standing in the place that makes me feel most in touch with myself and my surroundings, I suddenly realized how removed I’d become from others. Those 149 hours ashore didn’t include opportunities to respond to your comments, visit your blogs, celebrate your recent successes or wish you the best in hardships. Instead of the reciprocal conversation that’s the great beauty of blogging, I’m afraid Hooked has veered dangerously close to becoming That Guy – the one loudly holding court at a party, dominating all conversation with his own self-absorbed monologues. No one enjoys getting stuck with that guy. I definitely don’t want Hooked to be that guy. So, enough about Hooked. How are you? What’s your latest triumph or challenge? Fellow bloggers, have you written a favorite post recently that you’d be willing to link to here? Fisherfolks, how did the season treat you? What are you doing next? I’ve missed knowing how you’re doing, buddies. Also, Hooked gained some additional readers recently. Welcome, new friends, and please say hello if you’re so inclined. I’m glad you’re here. By 6:00, the sun had already blazed a long trail above Sitka’s mountainous backdrop. Joel slept in as I headed up the dock, lured by blue skies, the Backdoor Café’s Saturday morning cinnamon rolls, and a solo walk to puzzle over a resistant piece of writing. I hit the harbor ramp with a smile. My smile became a grimace. I nodded to the man casting a fishing pole on a nearby float. “Doin’ great. Have a good day.” At the top of the ramp, I stomped onto the parking lot pavement. Like a threatened bear, an irritated chuffing broke from my throat. Really? We’re harbor buddies now? Just before he spoke, my stomach sank in recognition. I kept my face blank for a few passive aggressive beats. I grappled for handholds amidst Carl’s tornado chatter. How’s it going. Yep, running a boat with my partner. Pictures? Huh, no, don’t recall. Nice to see you, gotta go. Fleeing into the library’s quiet, I felt snared by unforeseen remembrance. I was 19 when I got my first job crewing for someone other than my mom. Broken by a series of bad seasons and major expenses, she’d had to sell the Willie Lee II. Like many boat kids, I’d been anxious to stretch my deckhand wings, eager to prove myself working for someone who wasn’t family. My new captain was a type of man I’d come to know well over the next decade. Men of my dad’s generation, who prized work ethic above anything, they saw a female worker not as a weak link, but a delightful novelty. Men who were tickled to see a petite young woman hurl herself against physical labor. The other deckhand and I did the same work, yet our captain had a clear favorite. This didn’t endear me to my crewmate. 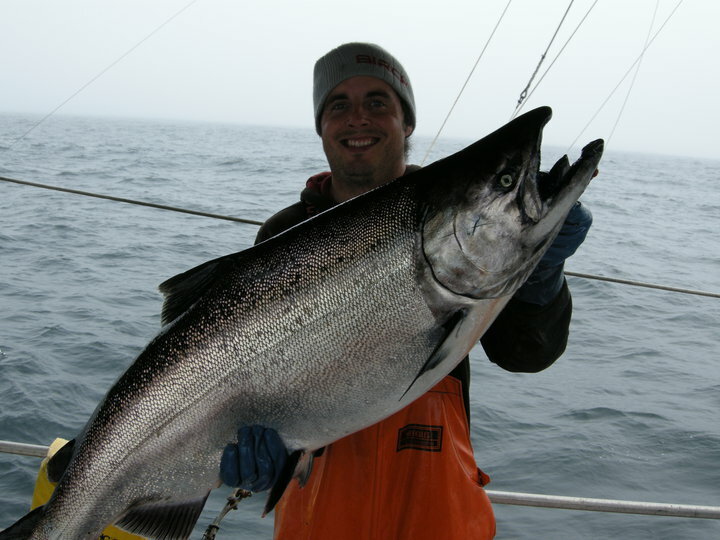 In his mid-20’s, Carl had worked on giant processors in the Bering Sea, but had never been salmon trolling. For three months we cleaned fish alongside each other all day and slept in bunks mere feet apart. We seemed to share the same 52-foot universe, but in truth, Carl was beached on a desolate island. Our captain and I were veteran members of the Southeast Alaska troll fleet, and our conversations built fences instead of doors. On a boat, three can be a far lonelier number than one on land. Carl was a good sport – better than I would’ve been in his boots, really. Chatty, good-humored, helpful. But as the season went on, he descended into sullen silence. I don’t remember asking why. As if he’d shouted the Empress has no clothes, Carl shattered my illusion that if I worked hard enough, I could erase gender. Make myself more fisherman than female. I don’t remember my response. What I do remember is picking a fight with him an hour later. 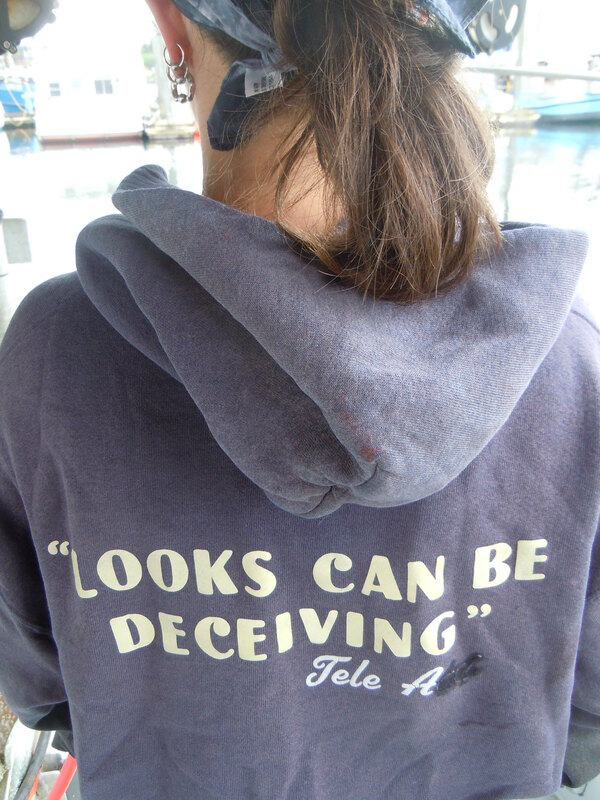 When he turned the boat’s 10-inch TV to a scratchy episode of Cops, I scoffed the show’s racial caricatures. Knowing our oppositional views, I went there anyway, deliberately, and Carl replied just as the script said he would. The gloves came off. I didn’t know how to speak a sudden sense of gender frailty, how to name the resentment of being viewed as concubine rather than coworker. But I could rage to defend another group’s misrepresentation. That felt easier than speaking up for my own. The remaining weeks thrummed with tension. I didn’t tell our captain. When we reached Seattle, I hopped off the boat and didn’t look back. However anonymous you feel on the big blue, there’s no escaping your past once you hit the dock. West Coast fishing communities blur into a small, secret-less neighborhood. Given enough time, you can count on tying up next to the person you could’ve gone the rest of your career without seeing. Fifteen years later, I consider for the first time the courage behind Carl’s admission. I’m unsettled by my reactions, then and now. Self-examination veers dangerously close to the apologist behaviors women are so socialized for, and I turn away. Surely there’s a lesson in this – isn’t there always, in situations that leave us feeling like we’ve fallen off the sidewalk’s edge? – but I haven’t found it yet. Have you worked somewhere that your gender made you stand out, or have you worked alongside someone else in this situation? What lessons did you take from the experience? Fair warning, readers – this is an unapologetic love story. Today is a special day that requires some sappy reflection. Those of you stopping by for a hot fish report or our latest wildlife encounter, please come back later and Hooked will be back to the more usual fare. The Charity came back to Sitka when the July king season closed. Responding to the same autopilot driving other deckhands’ feet, my route from the harbor paused at the public showers, then set a course for the Pioneer Bar. The P Bar’s attendance reflected that of the full harbor, with fishermen wedged five deep like boats rafted together. But this wasn’t a little kid sitting next to me. I studied his clear green eyes and guileless smile, and thought of the clipping in my pocket. I was prowling for a summer fling and he appeared to have grown up well, surely didn’t fall under my restricted categories… No. Hoping this fishing vacation would fend off my increasing tremors of social service burn-out, I was back in Alaska to work. Cute as this boy was, after my previous dating mishaps I didn’t need any further complications. Of course, sweet reader, you know how those kinds of self-assured proclamations go. The next night we walked through Totem Park, submitting ourselves to a voracious darkness, and spent hours talking on the shore. Discovering a kindred spirit in the Southeast Alaskan rainforest, gently holding each other’s shared history under the chaperoning eye of moonlight as the surf’s faint chuckling approval echoed our words…My guarded heart didn’t have a chance. And so, at the age of 22, Joel became Cap’n J. The transition was less-than-seamless. The old man had a nose for when to get out, and handed the helm over just as every essential system on board gave up the fight. Joel would have to author his own blog to share the stories from that first season; I still get the willies remembering the mountainous series of mishaps. Had I staggered free of a season like Joel’s first, that might’ve been it for my fishing career. But to his immense credit, his love for fishing was stronger than the suffering he’d endured. Blessed with a herculean selective memory, fueling his commitment with the recollections of good days, Cap’n J set about reviving the Nerka. Six years and an exhaustive, expensive undertaking later, he’s resurrected her to a seaworthy vessel, a fishy boat that responds eagerly to our requests. And now, today is Cap’n J’s birthday. He’s turning 29, on the cusp of finally exiting his twenties. His birthday falls in the midst of our season’s annual closure, and in his early years as skipper, this break meant massive boat projects, trying to fend off disaster enough to make it through the season’s remaining 6 weeks. There were several consecutive birthdays that he spent upside down in the bilge, saturated in engine unmentionables and despair. Not this year. Our projects minimal and mostly done, we’re going to celebrate with the luxury of sleeping in – not as in, “I’ll set the clock for 4:45 instead of 4:30,” but “What clock?” – and mosey through the day from there. The harbor’s full of friends to visit, and there’s some snuggling to do while we’re town-clean and still smelling fish-free. About as relaxed as you can hope for mid-season, 4 days before a 72-hour king salmon opening. I couldn’t ask for a better life than this, working for my best friend in the wild temple where we both worship. Please join me in sending your good thoughts to Cap’n J for a wonderful day – or, as he’s hoping, for a delayed birthday present of giant king salmon and plenty of them, with clear skies and fair seas to boot. Still as fish-crazed as he was 25 years ago. You know the one. Maybe you’ve struggled with your own version. Maybe someone explicitly stated these rules, building a box around your self-image one rigid, restrictive word at a time. Maybe we absorb a cultural narrative, sucker-punched by the messages saturating daily life. The box goes up higher still, stronger, until we can’t distinguish where the walls end and our true selves begin. 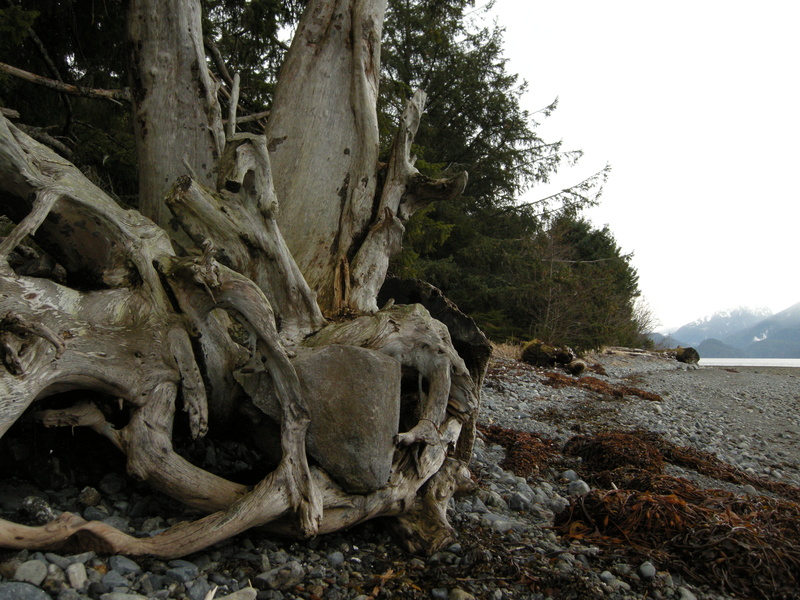 Rock with Driftwood – trapped & constrained, or securely embraced? 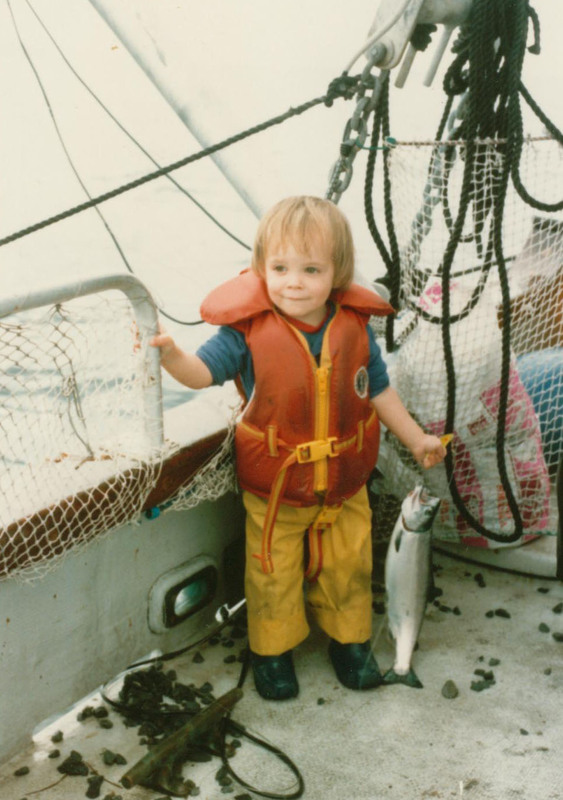 I was 27 when, burned out and broken from my 7 years as a social worker, I fled back to fishing. It seemed a good omen, exchanging a social service life for a boat named Sadaqa, the Arabic word for charity. Full of good juju, we were Team ‘77: vessel, captain, and crew, all born in the same year. 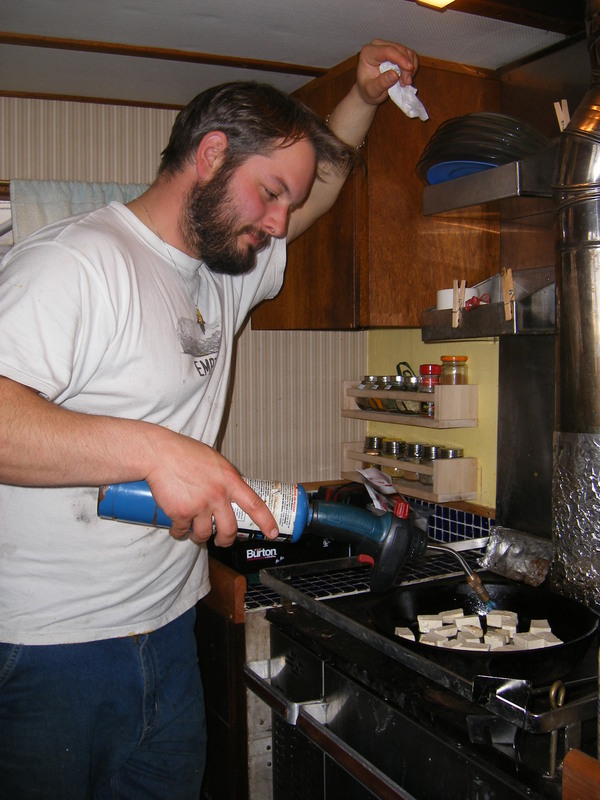 The captain crisping our tofu, blowtorch-style. Joel and I were a couple for almost 2 years before I agreed to crew for him. After earning a reputation as a skilled deckhand, I was afraid of going backwards in the fleet’s eyes, being relegated to “the girlfriend” on a boat. When I hopped aboard the Nerka, the chip on my shoulder was a 4×4 beam, ready to bludgeon anyone who’d box me into a stereotypical role. As is so often the case, I ended up clobbering the person I loved most. Turned out Cap’n J had never done the cooking on board, and, consumed by the full-time task of keeping the Nerka functional and fishing, wasn’t eager to start. Of the 7 boats I’d crewed on, all of my previous captains had handled the meals. The realization that I’d be the woman in the galley, taking direction from my male partner, sent me into a total tailspin. We had some ugly scenes those first few years. The ridiculous, complicating truth? I love food, and believe anyone who enjoys eating yummy goodness should know how to prepare said yummy goodness. I’m the conflicted feminist who carries still-steaming pies down the dock to share with friends and cooks big pots of soup to keep on the stove in case anyone stops by – and who resents the hell out of anyone assuming I’d do these things. It’s been a long road to realize my struggle has more to do with my own internalized sexism, insecurities stashed in my psyche, than the actual perceptions of my fishing friends. The fishermen who thought I was a good deckhand before I joined forces with my sweetheart, they still think so. Cap’n J and I navigated this storm, creating a pretty awesome partnership along the way. Peace generally reigns, on deck and in the galley. Me cooking is the most efficient use of our respective skills (and appeals to my controlling nature), and he does the cooking at home, enjoying the big kitchen. Everyone wins. I was reluctant to post recipes on Hooked. Had a whole big back-and-forth in my head about it. That nasty voice sneered that I’d be boxed as “that fisherwoman who blogs about fish recipes.” But your time is valuable, sweet reader, and I want you to gain something from your visits to Hooked. Beyond these stories, the tangible offering I can share is a deep love for wild seafood, and some of our favorite ways to enjoy it. Delicious, heart-healthy, beautiful fish… If not from our boat to your table, at least from this page to your recipe box. 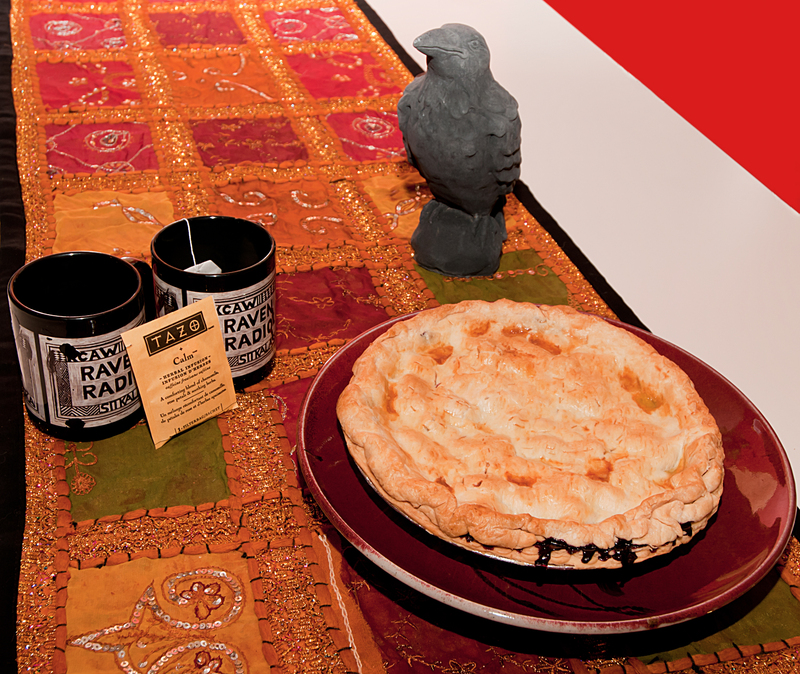 Pie and tea? Yes, please.